While ORICE works in a number of different ways, it has a long standing International Service Learning Program (ISL) that has involved courses across the institution. 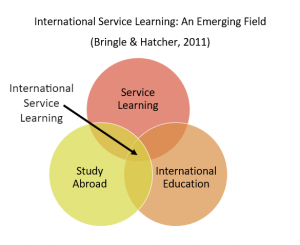 In ISL we draw upon Bringle and Hatcher for international service learning. 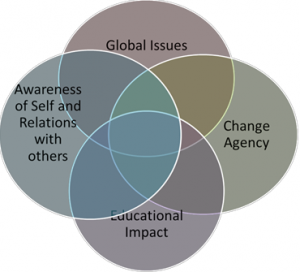 This diagram is meant to demonstrate how international service learning is more than just service learning in an international location, it is a interaction between these three domains. ORICE works in collaboration with faculty members to strengthen student learning outcomes. In addition to the outcomes for a particular course (ie. PSYC 417A), the ISL program has the following learning outcomes in place for all student participants. i.Involves an exploration of self perceptions, as well as an examination of one’s social location, and the power and privilege circumscribing one’s experience and engagement with others. i.Critical analysis of the local and global context of a particular issue including an awareness of the complex network of actors and policies that shift or maintain global inequities. i.Understanding of sustainable change as a collaborative/ participatory process. Interrogation of one’s own interpersonal and intrapersonal conflict resolution skills. ISL connects students and faculty from a diverse range of backgrounds, academic disciplines, and interests with community-based organizations across the globe. By engaging directly with poverty, disability, conservation, health, education, sustainability, and other important issues, students are able to better understand both the impacts of development at individual and community levels as well as gain a better understanding of the challenges and successes involved in international development. During course-based placements, students are partnered with community organizations abroad for twelve weeks.They spend this time working with their community partner towards supporting the organization mandate and addressing broader facets of social change. Combining these placements with courses such as history, economics, sociology, or psychology allows students to earn course credit in a unique learning environment that fosters the application and critique of theory to practice. ISL Courses are typically taught on campus, with students traveling to an international location after completion of a portion of the course to participate in a field placement related to the course content. During the field placement, students engage in research related to the course content, as service for a community organization; academic preparation is critical to the research-related service activities that students undertake in the field. In some cases, faculty travel to the international location to participate in a mid-placement workshop with students. Courses may resume on campus following the field placement to facilitate students’ ability to integrate the course content and their field experiences.